This road map of the island of Jersey has tourist information, indexes to places of interest, hotels and restaurants. It includes a town plan of St Helier. 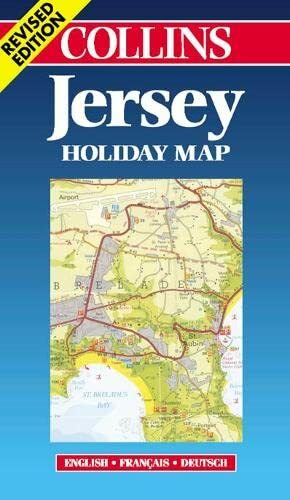 Revised large scale road map of Jersey showing tourist and leisure features and including lists of hotels and restaurants. Scale 1 : 30 000 (1cm to 0.3 kms / 1 inch to 0.5 mile). MAIN FEATURES Road map of the island of Jersey with tourist information, indexes to places of interest, hotels and restaurants. INCLUDES Town plan of St Helier. Text in English, French and German. AREA OF COVERAGE The whole of Jersey, the largest of the Channel Islands. WHO THE PRODUCT IS AIMED AT Tourist and package holiday maker. OTHER PRODUCTS IN THE SERIES Guernsey, Sark and Alderney Plus a range of maps covering most popular holiday destinations.